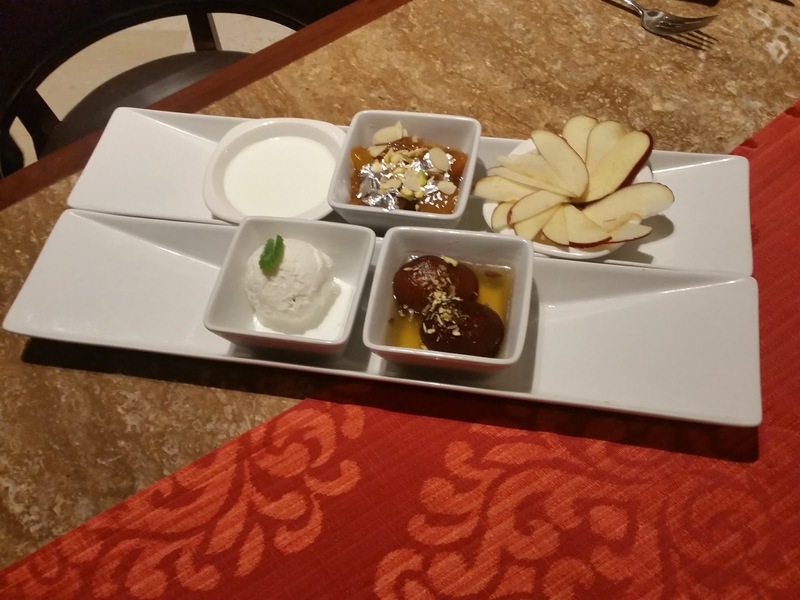 Fans of Kangan are familiar with the high standards of food there. Dal Kangan, their variant of black gram dal is immensely popular in the city. I have had quite a few great experiences there, my favorite being a dish called Palak Anardana Tikka, a soft veggie kabab having spinach, cottage cheese and pomegranates. So I have visibly looking forward when I was invited to review their new brunch. 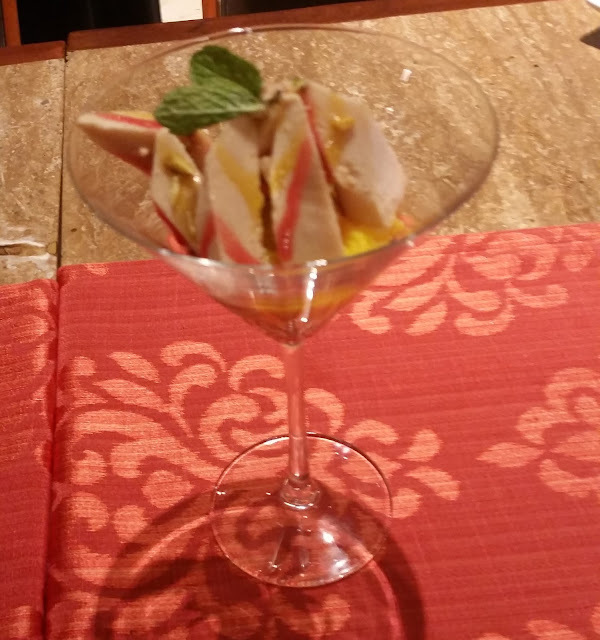 I met Executive Chef Rakesh Singh Anand at the restaurant who explained in detail the concept of this brunch. Many in the city would like to have completely Indian food on a leisurely Sunday afternoon instead of multi-cuisine, and they as well as returning loyal customers are some of the people for whom Kangan has specially opened its doors on Sunday afternoons. As one may be aware, Kangan otherwise is open only in the evenings. 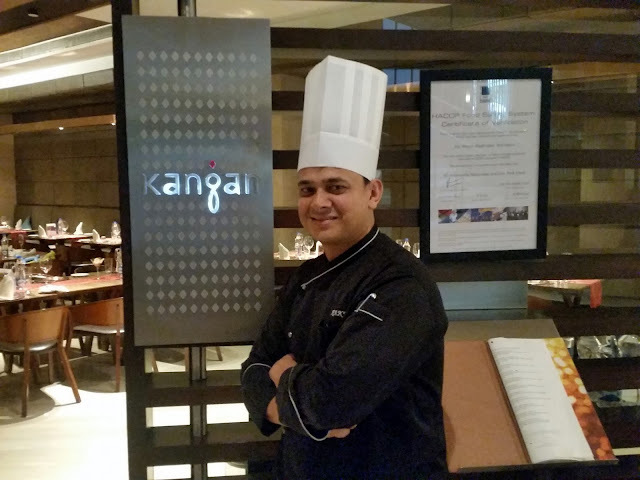 Chef Rakesh is a person who is very enthusiastic about the cuisine, and he detailed me about all the experimentations which go on in their "Kitchens of Kangan" initiative to evolve interesting dishes for the diners. The buffet has been laid out in one side of the restaurant shrinking the seating area. 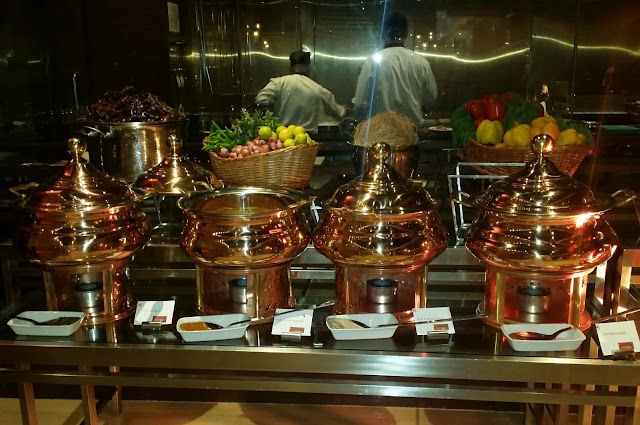 It starts with the soup, salad and condiment counters on the left, followed by the vegetarian and non-vegetarian main courses, the biryani counter and finally the dessert section with a live counter for jalebies. I started with a mocktail called Herbal Fare. The green herbal drink had basil, pudina and honey in orange juice and had a soothing effect on the palate. The buffet had about elaborate starters, four each in veg and non-veg and I ended up trying all of them. 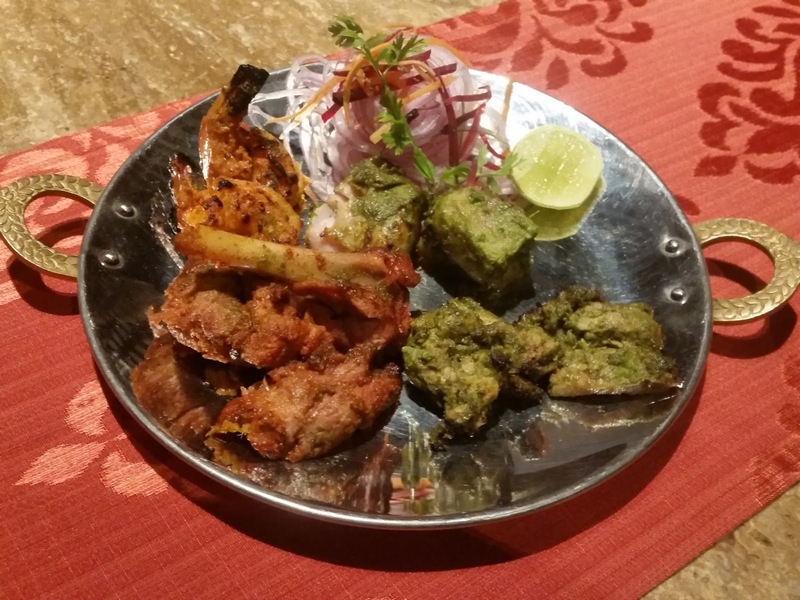 My favorite was Mahi Kagji Nimbu Tikka, boneless fish cubes in a tangy green marinade. Barra Kabab, a well known lamb delicacy from the North East Frontier tasted succulent with the meat cooked perfectly and smoothly coming off the bones. Murgh Kari Patta and Tandoori Prawns were good but not great, though the idea of using the curry leaf flavours in kababs to tickle the palate appealed to me. Among the vegetarian starters the Hare Masale Paneer Tikka is a must try simply because of the delicious marinade of green herbs. Subz Tarkash Seekh, a vegetarian seekh kabab stuffed with cheese and veggies was another Kangan specialty that was on the day’s menu. Chef Rakesh informed me that the brunch menu will change every week, and they have quite a few menu variations in their kitty to offer in different weeks. After overfeeding myself on starters as usual, I sampled the Murgh Noorani Shorba, which was of right density and flavourful with a base of coconut milk. Then after a quick look at the buffet and its variations I landed up with some nice Dahi Bhalla. There were some veg and non-veg salads on display, but I did not venture out to try them, as I wanted to conserve for the main course. At this stage I had a change of drink. On Chef’s suggestion I tried out a non-alcoholic bubbly beverage from Isabella Spagnolo. I had the colored version which was a good drink and worked as a palate cleanser, though the taste was not truly like sparkling wine. Finally to the main courses. Where apart from the biryanis there were quite a few veg and non-veg delicacies. 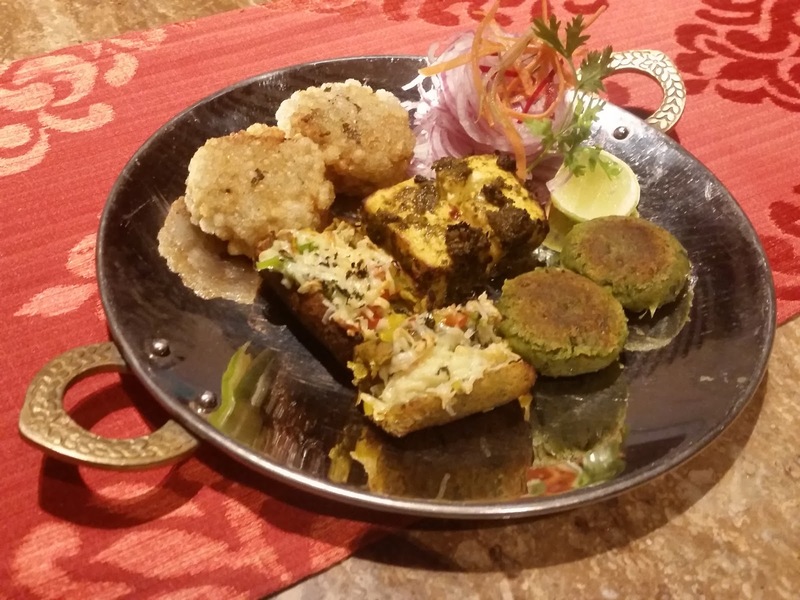 Of the vegetarian dishes, Paneer Nazbu, which had stuffed paneer cooked in masala was extremely good with kulchas. I also liked Aloo Benazir, which had potatoes with insides scooped out and stuffed with cottage cheese and then cooked in a gravy. Dal Kangan never ceases to amaze me. 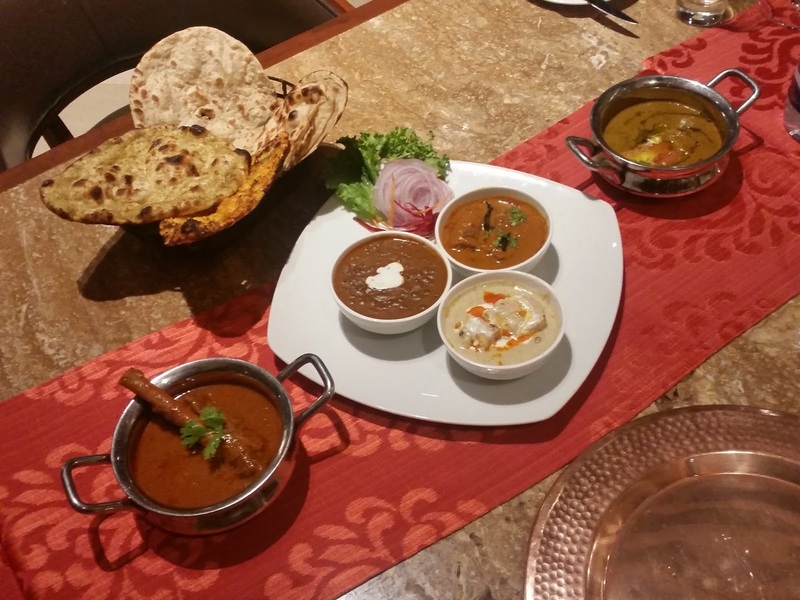 Chef Rakesh stressed that the dal has to be cooked for about at least half a day, and the proportion of ingredients such as tomatoes and cream play a vital role in the final taste. 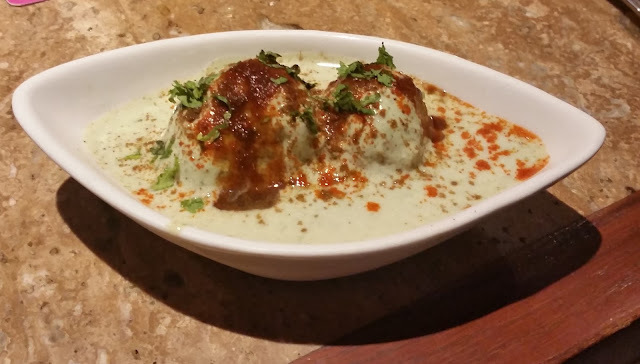 Koh E Peshawar is another signature dish of Kangan, where boneless chicken is prepared in a curd based white gravy. The gravy is creamy and tasted heavenly with kulchas. Sarhad MachIi (a spicy fish curry) and Saag Gosht (lamb in a gravy of palak and methi) were the other two non-vegetarian items on the day’s menu. The Murgh Dum Biryani at Kangan has a much more subtle taste than the usual Hyderabadi biryani. In fact in most biryanis available in the twin cities, the excessive use of chillies tend to overshadow the other spices, but here the biryani was basking in its true aroma. The Mirchi Ka Salan served with it is not to be missed. The vegetarian Subz Dum Biryani was a trifle too tangy for me – possibly because hung curd is used in it’s preparation. After the sumptuous meal, I had to excuse myself from the desserts. 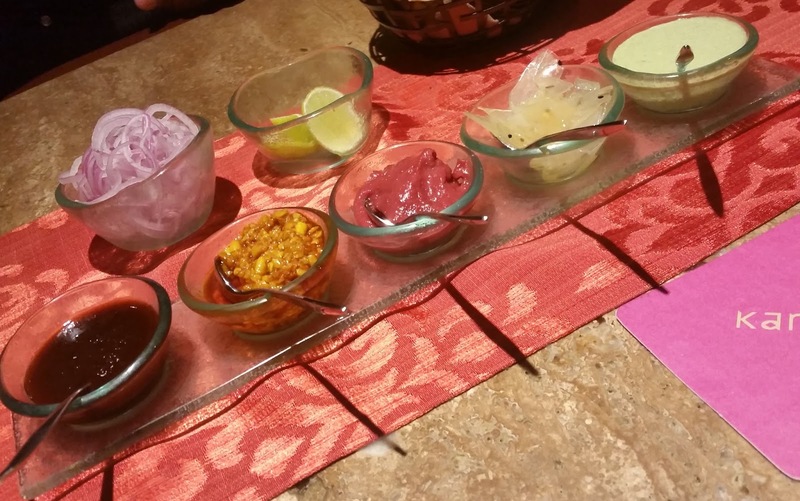 There were a lot of choices in the dessert counter including Gulab Ki Kheer, Gajar Ka Halwa and Kulfi Falooda. Chef asked me to try out a special dessert which had small gulab jamuns in a cheesecake, the concept which I particularly liked as the two components had different levels of sweetness. The strong point of the buffet is that it gives you an overall view of the high standard of food available in the restaurant. The Chef has made sure that many of the signature items of Kangan are featured on the menu. 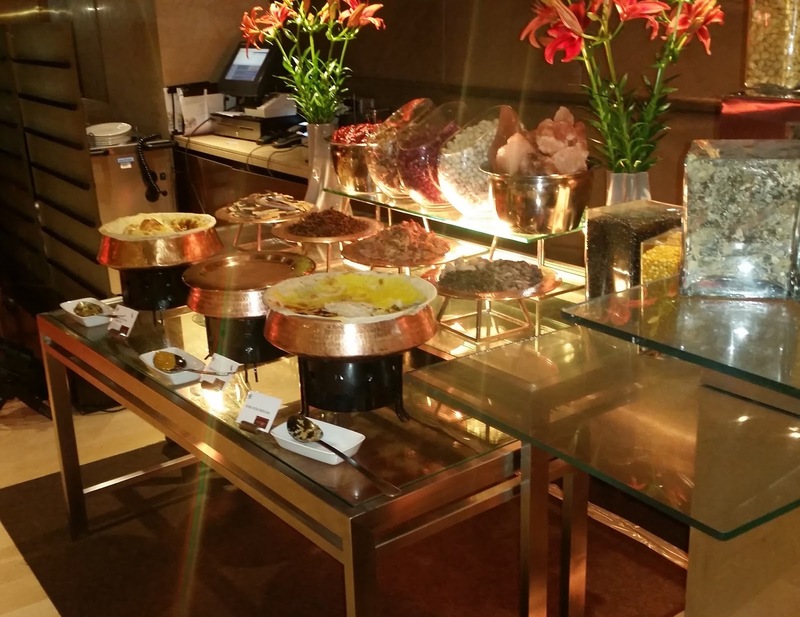 Keeping in mind the loyal clientele, the menu of Sunday brunch will change every week. I feel the completely Indian Sunday brunch will be appreciated by the discerning food lovers of Hyderabad as well as aficionados of Indian cuisine. 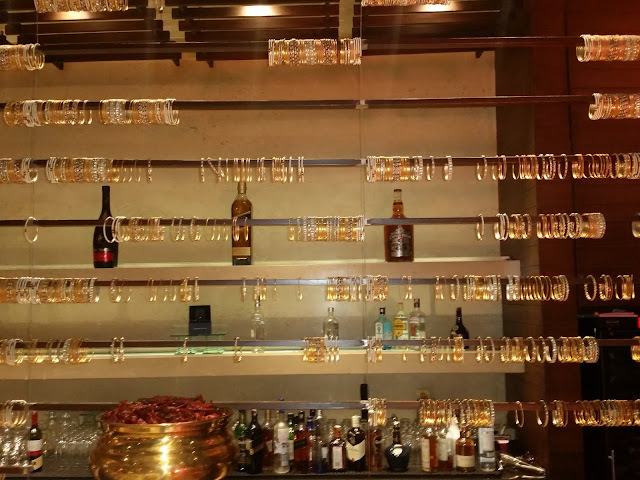 The Brunch is priced at Rs 2499 plus taxes, including alcohol.